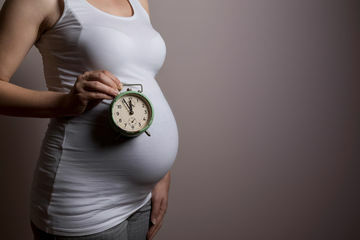 We've all heard that fertility starts to decline after a certain age—but if this research is any indication, that whole "biological clock" idea might be out the window. "You should have a baby while you still can." "You won't be able to get pregnant after a certain age." Chances are, if you've chosen to put off motherhood a bit you've heard these statements. And while they're inappropriate, they do have scientific backing behind them: A woman's egg supply depletes as she ages, which can make it make it much harder to pregnant later in life. But if recent research is any indication, there might be a way around this. We've always believed women are born with a certain number of eggs, and that this number can't be changed, but a new study found something completely unexpected—and it just might change the way we think about fertility forever. Researchers at the University of Edinburgh set out to study cancer drug ABVD, which does not reduce the fertility of cancer patients—and they found that women who took this particular drug had much higher density of eggs than other women of the same age. They presented these findings at European Society of Human Reproduction and Embryology annual conference in July. Lead researcher Evelyn Telfer, PhD, spoke to The Guardian about the research. “This was something remarkable and completely unexpected for us. The tissue appeared to have formed new eggs. The dogma is that the human ovary has a fixed population of eggs and that no new eggs form throughout life," she says. While this is far from a sure thing, this does represent a major, major breakthrough: Could replenishing fertility after that window has passed be possible, thanks to this drug's ability to help women create fresh eggs? If so, this research has come at the right time: Women are delaying motherhood more and more these days—and while many have to do a bit of a juggling act (weighing personal desire to wait to get pregnant against scientific evidence to suggest this isn't a smart idea), this news might make it easier for women who simply aren't ready for motherhood until later in life.